Only ten days ago at Jan. 19’s Hoophall Classic, 6-foot-10 Worcester (Mass.) Academy senior Matt Cimino raised eyebrows with a 22-point, 8-rebound performance for his school in a loss to Cushing Academy. One of those coaches that was made aware of his performance? Indiana’s Kenny Johnson. Cimino spoke to Inside the Hall on Saturday and told ITH he and Johnson have maintained contact since Hoophall, and that he has plenty of interest in the Hoosiers at the moment. At 6-foot-10, Cimino could certainly help fill that void. A self-described versatile player, Cimino said he feels comfortable playing both inside and outside, as well as defending either the four or the five. The 247Sports Composite ranks Cimino as the No. 143 prospect and No. 34 power forward in the 2014 class, and he has previous offers from Boston College, Virginia and Kansas State. Since the Hoophall Classic, though, George Washington has offered, and Cimino said he has the best relationship with the Colonials’ staff at the moment. He plans on taking one of his official visits there but doesn’t know when. Vanderbilt, Rhode Island, Wake Forest and Virginia Tech are recruiting him hard, as well. As far as his relationship with Indiana is concerned, though, it’s still a budding one. Cimino said Johnson planned on visiting him last Friday, however Cimino injured his ankle in the loss to Cushing and was not participating in practice. He said Johnson might visit him either this week or next week. And although he still has a ways to go in his recruitment, Cimino knows exactly what he wants in a school. On Tuesday, it was revealed that Indiana is involved with Morgan Park (Ill.) forward Josh Cunningham. 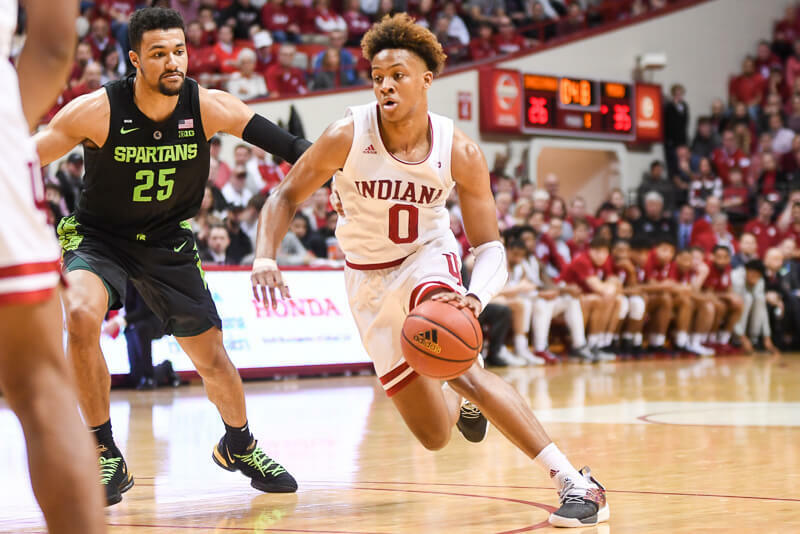 Initially, Cunningham confirmed a report by D1Circuit that IU was one of his finalists along with Oklahoma, Creighton, South Carolina, DePaul and Bradley, but he later tweeted that he has not cut his list. Cunningham, a 6-foot-7 forward, is rated the No. 122 prospect and No. 28 small forward in the 247 Composite. · Tom Crean was at Waggener high school in Louisville on Tuesday evening watching class of 2015 Louisville Trinity big man Raymond Spalding. The 6-foot-9, 200 pound forward is rated the 109th best prospect in the 2015 class by the 247Composite. Spalding scored 14 points and grabbed 16 rebounds as Trinity beat Waggener, 71-51. 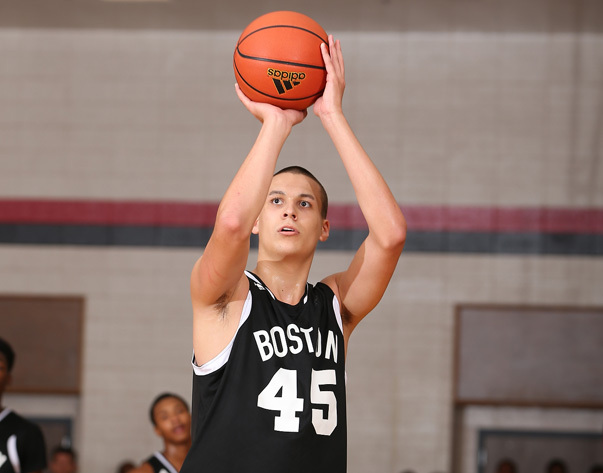 · Another big man Indiana is showing interest in is 2015 Northfield (Mass.) Mount Hermon power forward Josh Sharma. 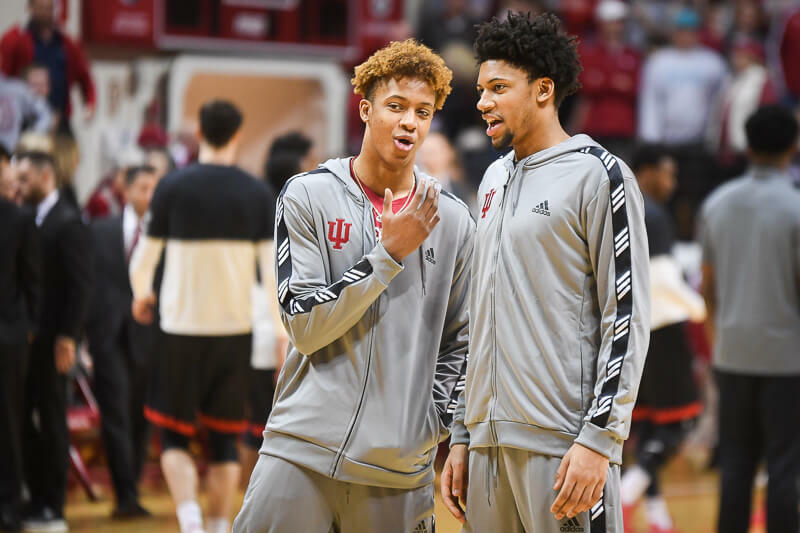 Sharma, who is 6-foot-11, told Inside the Hall that the Hoosiers have not yet offered, however that he has indeed spoken with Johnson on multiple occasions over the past couple weeks. Sharma is rated the No. 77 prospect in next year’s class and has offers from Wisconsin, Maryland and Connecticut, among others. · We mentioned it in yesterday’s roundup, but rosters for the McDonald’s All-American game will be announced tonight at 6 p.m. ET on ESPNU. If James Blackmon Jr. is selected, it will mark the fourth straight season the Hoosiers have landed a McDonald’s All-American. Which IU under Coach Crean has done EVERY year starting with the Hulls, Watford, Elston Creek class. The “worst” class in there was Victor and Will, and I will take those two any day! I’m not judging this recruiiting class.. was commenting on last years which has had a season and a half. Not calling it bad, just saying that it’s becoming pretty clear it’s not the program defining class that so many made it out to be.. including myself. What “La La Land” do you live in? Coach Crean did everything that a coach could possibly do to recruit Harris, while Dawson and McGary just didn’t want to go to IU (same for Trey Lyles, Teague, Robinson and others). All elite coaches know about the State of Indiana and HS basketball there/here! Now all of the top 50 programs know that Indiana kids want to be “the star” more than to be “Indiana Legends” like Cody and Yogi! Could Bluitt beat out Troy Williams as a scorer-no. Could he beat out Devin Davis as a tough guy on the boards-no. Can he score from 3 point range like James and Robert-no. Xavier is a good fit for him, and he just might prove me wrong. I like the kid! I liked the PG from Bloomington South that went to Xavier, but could he beat out Yogi-no. I don’t want “instant impact big (s)”. I want 1-2, 6’10-7’2, workaholic bigs, to become 4-5 year career bigs, every year! It works pretty well for WI! JUCO and 5th year bigs are huge projects, just not much time projects! I like it the way it is right now. Yes IU and Duke, etc. have a 1 and done every once in a while, but KY has 5-7 wanna-be’s each year. And the 3-4 that don’t make it as 1 and dones get disinterested in college basketball. Look what happened last year to KY (lost in first round of the NIT)! Look at them this year, KY has 4 loses to teams outside the RPI top 50; while this “average” IU team has only 3 (IL, NW and ND). IU has beaten the #3 RPI team WI, and is 1-3 against RPI top 10 teams! If it HURTS KY, then KEEP IT!! What do you know about this Cimino kid, Scoop? Ah, he is a well-built, very powerful, 6’3″. Very good defensively, very strong. He’s not a freshman, is he? I’ve asked this numerous times, but why won’t Crean play HMP / Noah together, EVER? Absolutely, it would be better for everyone. The NBA would benefit tremendously by getting MUCH more polished products. There is maybe, MAYBE one guy every other year that is capable of going straight to the NBA from HS. Kobe, LeBron and Durant are pretty rare talents. Look at all the ‘Super Freshmen’ (Parker, Wiggins, Randle, Gordon) that ESPN is constantly frothing about. NBA capable? Yes. NBA ready? Not one of them. Just imagine a line-up with Noah and Cody……. Wrong!! Most Bigs need to develop in college! WI has 1-2 Bigs emerge as “impact” players as Red-shirt Sophomores or Juniors every year! Every Big is a project! Cody’s and Noah’s are very rare! Payne at MSU emerged as great half way through last year, he is a senior this year. Take a dose of “reality”! It is way too late to begin to look at JUCO’s. I am sure IU has a list, carefully researched. I agree with what you wrote except for the ‘Very probable’ that Noah stays. 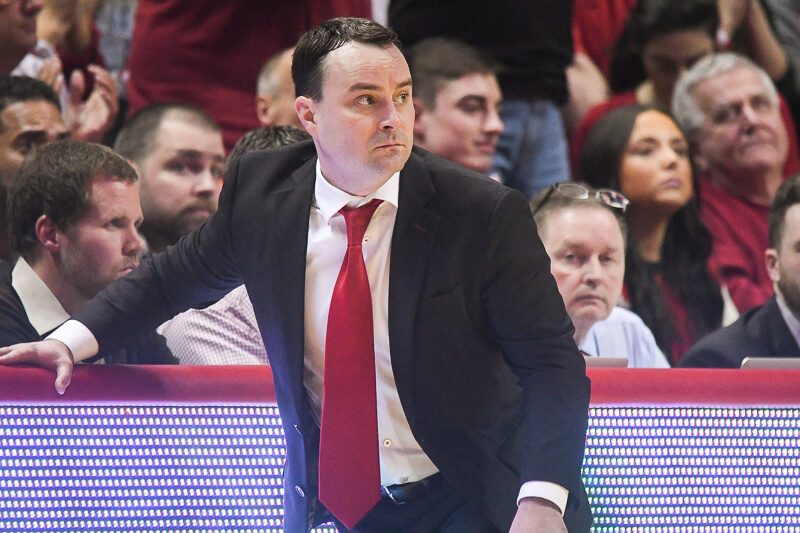 I think it is more possible than some, but the fact IU is actively recruiting big men and telling them they’re ‘not sure if Noah is staying’ is telling. Agree here – I think he is a sure-fire first rounder, likely even lottery, but, as many on here have said, there’s a big difference between those who go in the top 5 and those in the 5-10 range dollar wise . . . if he’s not top 5, could be added incentive to stay. Given his development and work ethic, he could be seen as a likely #1 next year – especially if he helps lead us to NCAA success . . .
I’d love to have him back. At the same time, I really would like to see Hanner continue development .. . maybe HP as a third-year would be better than a freshman – not that we couldn’t have both – if NV leaves we definitely need someone. All that said, I’m in favor of a quality 5th year transfer to fill the gap. I agree. I stated that in an earlier article that “The Movement” has turned out to be just Yogi. Paterson never made it in to IU, Jurkin never sees the floor, HMP is a work in progress still, and Hollowell has yet to make a significant impact. Could they turn it around their junior and senior years? Yes they could, but if they don’t improve then I would consider that class a bust. Cody is just stuck with a very mediocre program that has no vision. If he were a Pacer, he would play 25 min and be close to a 10/10 guy! Scola is old and showing it, Mahinmi is raw. They have no one else on the bench roster over 6’9. Cody would excel! Not a sure bet that players develop more in the pros than in college-think Morrison #1 pick, flop, now gone vs Oladipo #144 in HS, then #2 pick. You need to read Cod’s diary. He specifically talks about not being able to work on his game. The travel is a killer! Once the 82 game grind begins, there are walk-throughs, scouting report sessions, film sessions, shooting practice, individual work with managers and occasionally a coach, conditioning/weight training, but almost never “practices” as you do in college. However, the other players are great. But older Bigs are going to rest their bodies, they know what to do, not bang up on the young bucks to help them improve! Early favorite for #1 if he keeps pace and stays. Yes, McGary missed his peak for the league. Now he is questionable with injuries. His style is all physical. If he gets injured against kids, what will happen against the Men! I see him as Karl Malone with hops! Almost all good college teams play 2 #4’s not a “true” #5. Who was the last “true” #5 from college to make it big as a pro: Cody-no, Sullinger-no, Davis-no, all were #4’s. Maybe Roy Hibbert (also Cousins and Favors)! And it took him 3 more years after 4 in college to really develop! It is a VERY small list! IU needs to be recruiting 4 stars and up whenever possible for every position. And there are many good, true centers available in ’15. I’d rather CTC saved a scholarship for that class; a class we have no scholarships for at the moment. No way Cody gets any more time as a Pacer, Scola is there to score and averages over 8 points a game in 13 minutes, not to mention 5 rebounds, He is heavily experienced in both NBA and international play with Argentina. If you have never seen Argentina play in a FIBA tournament you should watch them, they are VERY GOOD and Scola is a big part of why they have been so! Costello was great, but I did agree with Bilas when he said he should take those shots off of the offensive boards. Iowa looked TOUGH, Michigan State was lucky to come out of Carver-Hawkeye with the W! What’s going on with 2015 prospect Stephen Zimmerman — has he narrowed his list any? I love big men who can step out and shoot ala Dirk but I don’t see a whole lot of athleticism or a player who’s ready to play next year there. Let’s face it guys . . . barring a transfer or some amazing diamond in the rough somewhere we better just hope and pray that Noah Vonleh doesn’t go pro! I expect that the 2015 will include some talented big men because Crean went hard after shooters and perimeter players this year thinking that he had Perea/Vonleh/Fischer for the next couple years, but 2014 will be thin if Noah bolts! Costello was fantastic. Truthfully, MSU had no business winning that game. Iowa let one get away there. No. He is from Indiana and a good basketball player. I read in an article somewhere that he has Attention Deficit Hyperactivity Disorder. He’s no joke. Agreed, I will argue that Michigan is as good as it is this year because they have 2 big men with experience (Horford and Morgan) that are reasonably talented and have bought into Beilein’s system. What would you say to a recruit when no one, even Noah, knows what he will do in April? If they contribute to a Banner in that 4 year span, it will in fact be a “program defining class”! No one ever thought that TJ was a basketball player (including Crean), he was just big and IU had only Taber, Neither you nor I know anything about how Bawa “worked out”, he should be a senior this season. Personally, I think that he would play and contribute for IU if he were here this season at 7′ after 5 years in the IU program, but we will never know. Peter is still working, with probably 3 more years to “work-out” after this 2014 season is finished! I did not mention Austin, so I have no idea what your two sentences on him relate to. That’s why I picked my moniker. Are you a “junior McDonalds Hamburger”? And you have never seen a team without a top-top star: James, Nowitzki, Coby, etc., win the NBA Championship without quality Bigs (plural) coming off the bench. Cody does not have to beat out Scola, just add to him! I did not say that Scola was not good. I said “old and showing it”. You said “13 minutes…heavily experienced”. We are very close to the same thing! If Scola could play 20 minutes he would be playing 20 minutes! Right now West and Hibbert get 13 minutes of rest from a quality Big (Scola). Over 82 games, plus exhibitions, that is asking too much and it will show during the play-offs! They will be beat up when the money is on the line. Even Hansbourough was much better than Mahinmi. Cody would “excel” with the Pacers! Right now Cody is 5 points in 16.8 minutes with 2.7 rebounds, .47 steals, and 1.0 assist per game. We all know that Cody is young, fresh, in great shape and can RUN all day and all night! So i think that you are wrong, yes Cody would get more minutes and show more production with the Pacers! But it is only my opinion. You mention Mahimi, and Nowitski, did you not know Mahinmi won a ring with Dallas a s the back up center? I’d say your knowledge of what you speak is somewhat limited.